Barry Wilmot and Duplex advocate, Lyn Webster (LW Consultancy) recently visited Lord’s Cricket Ground to demonstrate machines from the Duplex range. 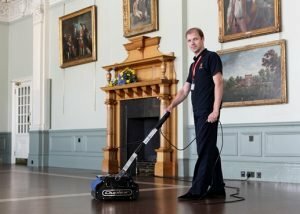 This led Sarah Brett-Purchasing Manager for MCC, owner’s of Lord’s, to choose the Duplex 340/Steam and 620/Steam as their preferred floor cleaning machines. The Duplex 340/Steam is pictured here being used to good effect in the Long Room Bar in the Grade II listed Pavilion and it will no doubt play it’s part in keeping the beautiful and historic floors at Lord’s in perfect condition. Duplex Cleaning Machines is proud to be a supplier to MCC and offers its congratulations on the Bicentenary of Lord’s Cricket Ground.